I was just curious on what is the min specs? I tried using this computer with an ssd and with 2gb 533 memory. Call quality always had problems. I tried several different solutions but same result. I wanted to try to record convo for record as well and the combination was even close to being successful. When using it in my desktop or anything it works pretty well, really no problems with more then 2 gb of memory. I think the one core atom didn't' help as well. So I was looking into anther client and just wanted to know any pointers for other peoples experiences or successes. Posted: Tue Jun 26, 2012 1:01 pm Post subject: Min OS Specs XPe SP2 or higher? MJ on Maxterm 8300 (800 MHz CPU/512Mb CF/512Mb RAM), Ramdrive 100Mb, XPe SP2 - performance VERY GOOD. MJ on Maxterm 8300B (578 MHz CPU/512Mb CF/512Mb RAM), Ramdrive 50Mb, XPe SP2 - performance GOOD. BUT MJ will refuse to install on any XPe with NO service pack installed. So, I gather that the minimum OS for Windows XP is XPe SP2. Anyone with any experience with XPe no SP or SP1 having MJ install? Magic Jack pops up a little yellow triangle and '!' in the middle. 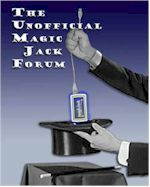 It reads as follows: magic jack is not supported on your version of Windows. Especially on how to update an XPe no SP or SP1 image to XPe SP2 or SP3 (without IDIFF).